People will put anything on eBay to make a fast buck. Even bits of crashed cars. 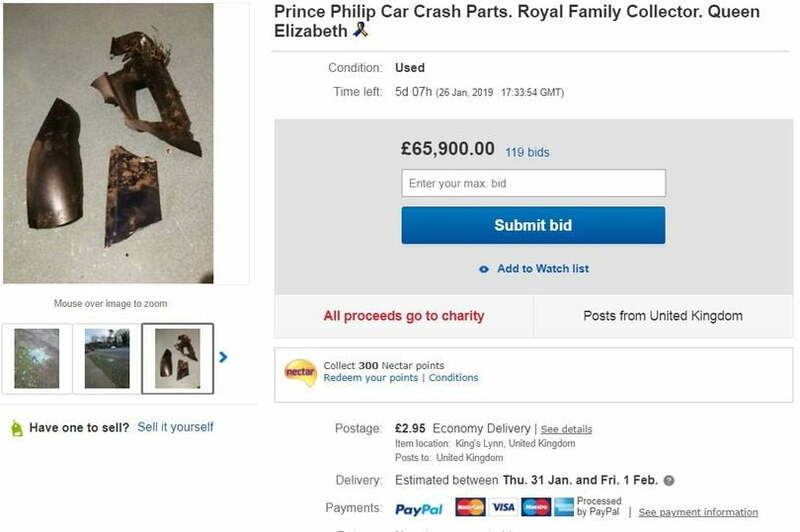 OK, this particular auction was always likely to attract some added interest as it claimed to offer debris from last week’s car crash involving the 97-year-old husband of Queen Elizabeth II. More than 100 royal fans — or possibly collectors of oddities — bid as much as 66,000 British pounds (about $85,000) before eBay took down the auction. The crash happened when Prince Philip’s Land Rover Freelander collided with a Kia vehicle last Thursday, January 17. Reports suggested he was pulling out onto a busy road when the smash occurred, sending his Land Rover rolling over. Somehow, he walked away unharmed. But two female occupants of the Kia were hospitalized with non-life-threatening injuries, while a third occupant, a nine-month-old boy, escaped unhurt. Subsequent news reports showed broken parts of the Land Rover — including a side mirror, shattered glass, and various bits of plastic — strewn along the side of the road. Two days later, some of it showed up on eBay. The seller, morbius777, insisted the parts were genuine, and promised to give the proceeds of the sale to charity.